Dr (TCM) April Kim believes in a patient centred experience, utilising ancient healing arts including acupuncture, natural herbal tablets, moxibustion, cupping and more for effective healing results. Formulated together with ancient theories on diet, lifestyle and adapting to our environment, a therapeutic healthcare management plan is created to optimise and enhance all aspects of living. Dr (TCM) April Kim understands that not everyone likes the idea of needles, so he uses the best quality acupuncture needles from Japan to ensure a smooth insertion with minimal discomfort. Herbs are made up of leaves, stems, bark, roots or seeds. They each have a unique action. Cleverly combined together they perform a multitude of tasks and help bring a holistic balance back to the whole body. All herbs are of the highest quality and are prescribed individually to meet each patient’s needs. There are many ways to take Chinese herbs such as in granule form or as small pills. Cupping is the placement of glass cups on specific areas of the body using a vacuum to move stagnant Qi (energy) and detoxify. It isn’t painful and may leave a small mark on the body for a few days. Moxibustion is a special herb that’s lit and placed above certain acupoints to draw heat into them. Moxibustion is not painful, just a little warm and is very effective for turning breech babies. 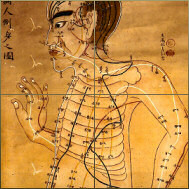 Acupressure is the ancient massage art form from China. It involves unique massage and manipulation techniques on tired, tense muscles as well as on specific acupuncture points and meridians. A typical acupressure massage session lasts up to 30 minutes. Gua Sha is a special form of treatment that uses a jade or plastic comb to dredge the meridians. A special oil is applied to the area to help move blockages. It's used as a diagnostic tool as well as a form of treatment to remove blockages in the body. It isn't painful and may leave a small mark for 7 days before fading away.